As the snow begins to melt, you may find your lawn full of circles or patches of dead-looking grass. While severe Winter conditions or late fall damage is often to blame, it is far more likely your turf is suffering from Snow Mold. What It Looks Like – There are two main types of snow mold; Pink and Gray. Both diseases appear in circular dead patches ranging from 3”-12” wide, however, if it is severe, these patches can form together and cover most of the lawn. If you look closer, you may see fuzzy webbing along the edges or even masses on the blades of grass (sclerotia). When the lawn is still wet the webbing may appear pink or salmon in color, to distinguish between the two types. It is not uncommon for a lawn to be affected with both Pink and Gray molds at one time. Prevention – It is very important to remember to “Put the Lawn to Bed.” A properly mowed, watered, and fertilized lawn is the best defense against snow molds. Treatment – As the weather warms and snow melts, chances are that the disease will go away on its own. Once the areas have fully dried with the temperature increase, the grass will begin to repair itself and the disease will grow out as you mow. To help speed this process, lightly rake the affected areas and fertilize the lawn to encourage drying and grass growth. If there are remaining dead spots, a reseeding may be required. 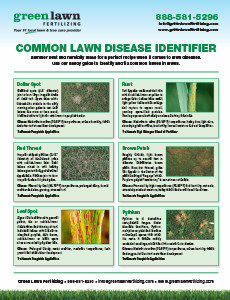 Fungicides are not recommended for this disease as the damage is temporary and the lawn will heal on its own.